This is an interview with Paul Javid, former Microsoft product manager and co-founder of the fitness app Cody. Here Javid speaks on mindfulness, connection and the role of digital platforms to build yoga and fitness communities online. Human capacity is limitless, and as long as we have the tools and resources we need, anything is possible. My desire to help people accomplish their dreams and give them the tools to do so impelled me to leave my job at Microsoft and start Cody with my co-founder, Pejman Pour-Moezzi. Four years later, what motivates me most is the desire to grow with the incredibly talented people I work with every day – the employees, coaches, and community that make up the CodyFam. With a practice of mindfulness we open up to love our neighbors, our communities, and even people we haven’t met before. When we take the time to connect with our innate desire to love, social change isn’t a task – it’s one of life’s greatest joys. When we love someone, we naturally start to give and support them. This is why love is, in my opinion, is one of the most powerful tools for social change. Perhaps what’s often forgotten in the journey of love is the love of self. We must learn to love who we are, and find strength therein before we can give ourselves to someone else. We must first believe that anything is possible before we can teach someone else to believe the same. These deep-rooted feelings often require renegotiation with our own psyche, and this internal conversation can only be had with a practice of mindfulness. Today yoga is a practice, a community and even an industry. How is yoga evolving in contemporary culture? What’s happening to the demographics, and to the teachings? How has your own practice evolved? Ten years ago, Yoga wasn’t perceived by the mainstream as a rigorous physical practice, rather a slower, almost restorative form of fitness. Today, through the growth of social media, the world’s best practitioners are showcasing the incredible strength and control they have built through the practice of Yoga. Yoga has branched out from traditional methods and sequencing to a practice of whole health: integrating strength, flexibility, body awareness and mindfulness into a single practice. While Yoga has grown to appeal to a wider audience, the intention of the practice has remained intact – transformation of consciousness, identity, and relationship with community. Yoga is my moving meditation – one where I grow stronger physically as I grow stronger mentally and spiritually. What do you think the role of brands play in the shaping of the future of yoga and mindfulness? Can brands play a role in maintaining the integrity of the practice, and how are you contributing? I believe that brands are the organizing catalyst for Yoga. Whether a person practices online or in person, there is one or more brands behind every instructor that have helped bring students to their classes and even define their message. To believe that Yoga brands could operate without a strong partnership with Yoga teachers is naïve, and to believe that brands would have a successful business without also insuring the success of their instructors is short-sighted. Cody partners with the best instructors in the world, and has created over 200 hours of Yoga-based training. But our mission goes beyond creating great videos – we are changing the way Yoga is practiced online. One of the biggest differences between an in-studio class and an online class is online formats traditionally lack community. But, when students train with Cody, they connect with other people and watch stories be told. Dialogue unfolds through likes and comments. Even better, they can interact in real-time with other students from around the world by taking one of our Online Studio classes. Our Online Studio community is so powerful that many students wake up in the middle of the night just to participate. While we might observe that Yoga is getting more attention due to the physical or at times even acrobatic nature of the practice – the impressive handstands and arm balances – this is only showcasing the mastery that an individual has over their practice. I don’t believe this is overshadowing the spiritual authenticity of the practice, rather it might just appeal more, initially, to our physical nature. I believe we are keeping the spiritual authenticity of the practice intact because I believe that the Yoga instructors who are growing in popularity, locally, nationally and internationally are doing so, not only because they are physically talented, but because they also have deeper meaning and teachings that they wish to share. At a glance, particularly on social media, it might look like all that is being showcased is a strong pose or a flexible position, often revered in higher levels of the Yoga discipline, but as we read further, we will often find a powerful story of personal growth, an inspirational message, or even gleanings into one instructors perspective on the path to enlightenment and equanimity. We don’t try to influence what someone should practice, with whom they should practice, or what style of Yoga to which they should dedicate themselves. Rather, we are the loudspeaker for the practice of Yoga in general. We showcase that Yoga has something to offer everyone; whether you want to build strength physically or mentally, practice self care, or reconnect with your spiritual nature. Whether you have a big or a small body, you are young or elderly, you are an athlete, or you are overweight, we believe Yoga has something for you. In what ways do you think yoga addresses some of the societal factors at play in terms of the demographics of your consumers? In what ways does it not? Our trainings are designed to help users tackle a variety of societal issues. For instance, the “EveryBody Yoga” plan by Jessamyn Stanley, a teacher who is familiar with the challenges of practicing in a larger body, is designed to help those with body image to gain confidence and embrace who they are. The “Making Shapes” course by Dana Falsetti, who found happiness through yoga after years of binge eating, encourages students to embrace their full potential without feeling limited by their physical body. And Ana Forrest’s “Freedom from Struggle” class invites students to recognize and break free from emotional and mental roadblocks, building self-esteem and strength. Working with teachers who represent a variety of different traditions, backgrounds, genders and body types is a way we can truly encourage “yoga for everyone.” Cody is dedicated to solving the challenge of making online trainings an even more intimate, live experience between students and their teacher. I hope that Yoga isn’t just another fitness form that has to compete for attention with other forms of fitness. Rather it’s seen as one of the only forms of fitness that has a traditional lineage with a powerful message. I hope that in 10 years Yoga is seen as a tool that can empower people and build their strength mentally and physically. My biggest hope is that in the next 10 years we start to embrace the necessity to move every day and see Yoga as one of the best ways to implement a daily routine, regardless of age or gender. Join Give Back Yoga friends Mary Clare Sweet and Black Swan Music for a high-vibration celebration to kick off Hanuman Festival 2015. 5:00 pm Come down to Shine to enjoy a delicious meal and share in an evening of inspiring community from the heart! 10% of all food proceeds from the evening will be donated to Give Back Yoga. Join us in the Shine Gathering Place back room for a fun and funky evening! Amazing door prizes and gift bags offered by Peacock Arts, Affirmats, Spiritual Gangster, White Swan Records, Black Swan Sounds and more! This is an evening not to be missed, as we join together in celebration of community at this high vibration kick-off event for the 5th Annual Hanuman Festival! Help us spread the word! Join the Facebook event, share this blog post and download a copy of the event flyer. Join Give Back Yoga Foundation for a locally grown community fundraising event in our hometown of Boulder, CO on Monday June 22, 2015 5pm-9pm at The Kitchen Next Door. Denver friends, you can also support Give Back Yoga at the Kitchen Next Door Union Station — same date and times! The Kitchen Next Door is generously donating 50% of each meal purchased during these hours to Give Back Yoga. Patrons simply let their server know they are there to support Give Back Yoga, and 50% of their bill will be donated to the programs of Give Back Yoga. Our goal is to raise $2,000 for our programs. If you are in the Boulder area, please join us in for an evening of delicious food and inspiring community! Sign up for our newsletter to learn how your support is being put to work in the yoga service movement. Boulder-based Give Back Yoga corporate partners Ramblin Jackson and Outlaw Yoga are joining forces with Give Back Yoga to make this community gathering a success. Through local partnerships such as these, Give Back Yoga has been able to grow by leaps and bounds over the past several years. Together, we can leverage resources and creating community collaborations. It takes a village to mobilize a yoga service movement…and we hope you’ll join our tribe! Ramblin Jackson is a web marketing + video production company based in Boulder, CO. They love helping small businesses get found online through SEO, Website Design, Video Production, and more. Not only did they donate the production of our promotional video, but also provided SEO support in the creation of an updated website, launching soon. View the video Ramblin Jackson created for Give Back Yoga. Outlaw Yoga believes in making yoga available to all, and accessible for all. To hear more about Outlaw Yoga’s vision of yoga service, stop by our YouTube channel to watch a video interview with Outlaw co-founder Justin Kaliszewski and GBYF Executive Director Rob Schware. StapletOM Yoga and Music Festival Ticket Giveaway ~ September 19th & 20th! Join us for a yoga party! Learn how you can win one of two weekend passes to the first annual StapletOM Yoga & Music Festival in Denver on September 19-20th. Calling all Front Range friends: don’t miss your chance to experience world-class yoga in your own backyard! Join us at the StapletOM™ Yoga & Music Festival on September 19-20th for a dance party under the stars, yoga all day on the green, shopping from local artisans and craft vendors, the area’s best food trucks, and craft beer and wine. (One “must-try” festival brew: StapletOM Yogi Beer by Station 26 Brewing Company.) All levels and ages are welcome at the festival, where top local and national instructors will lead classes ranging from vinyasa flow to arm balances, journaling to afro-yoga. By joining in the fun, you’ll also be giving back: a portion of the proceeds from this event will be donated toward our mission of sharing the transformational practice of yoga with the world…one person at a time. Friday night is adults only – ticket includes a yoga session, one free beer or wine, and live music. Includes Friday pass PLUS all-day yoga classes on Saturday, activities, a raffle ticket and more. Purchase tickets for StapletOM™ Yoga & Music Festival. Win a weekend pass to the StapletOM Yoga & Music Festival (a $49 value)! To enter, send an email to shanti@givebackyoga.org with STAPLETOM TICKET GIVEAWAY in the subject line. Entries will be accepted through 11 pm MT on Sunday, September 7th. Two winners will be randomly selected and contacted by email. Passes will be available for pickup at the festival. https://givebackyoga.org/wp-content/uploads/2014/08/StapletOM-Yoga-Music-Festival.png 262 412 Grace Miller https://givebackyoga.org/wp-content/uploads/2019/04/givebacklogo-2019.png Grace Miller2014-08-13 15:54:272014-09-06 19:56:35StapletOM Yoga and Music Festival Ticket Giveaway ~ September 19th & 20th! A gift for GBYF community members: save $50 on a 4-day festival pass to Bhakti Fest West with coupon code GBY14. The Give Back Yoga Foundation is honored to be a seva partner of Bhakti Fest 2014, with a portion of all ticket sales funding our mission of bringing yoga to underserved populations like veterans, at-risk youth, prisoners and more. This inspiring festival series wraps up with Bhakti Fest West in Joshua Tree, CA on September 4-7. Yoga: 12 hours of daily yoga classes in four different venues, led by incomparable teachers like Shiva Rea, Mark Whitwell, Sianna Sherman, Kia Miller and more. All levels are welcome! Check out a pre-festival “master class” with legendary yoga master Dharma Mittra and a post-festival intensive with Saul Davide Raye. Workshops: From intimate chant sessions with Krishna Das and David Newman (Durga Das) to guided meditation sessions and inspirational talks with leaders in their fields, there’s something for everyone. Video: get a sneak peek at the incredible energy that is Bhakti Fest West. Help Bhakti Fest give back: get tickets to Bhakti Fest West and save $50 with coupon code GBY14. A gift for GBYF community members: save $30 on Pranafest tickets with the promo code SEVA. Pranafest was birthed in the summer of 2012 out of a deep desire to create a deeper sense of community, a divine weekend of play in devotion and to continue to create the emerging business model of giving back from the Festival production world. We are so thrilled to host world-class talent in a breathtaking setting such as the Wellsprings in Ashland, Oregon. Bringing the Bhav to the Rogue Valley and beyond, we love sharing our vision of a full-on celebration of devotion to the divine. Pranafest is a gathering of prayer and celebration, healing and deep communal connection, centered around natural mineral hot springs. The 3-day hot springs camping festival will feature classes, concerts and ceremonies by an all-star lineup of yoga teachers, sonic shamans and kirtan leaders, held from September 22-25, 2014 at the Jackson WellSprings, an idyllic 35-acre botanical wonderland world-famous for its healing waters. Pranafest will feature four stages of kirtan led by world-renowned wallahs from 9 am to 11pm daily, covering styles ranging from traditional acoustic to cutting-edge kirtronica. The festival also showcases group classes with some of the global yoga community’s most celebrated and revered teachers, covering a diverse array of yogic disciplines including Vinyasa, Kundalini, Anusara, Yin, Bhakti and more. Long gone are the days of hosting events with no mission, with no higher intent, no take-away other than the “feel good” of the weekend. We see festivals on a “green” mission, to reduce the festival footprint, leave no trace, reduce, reuse, recycle. Pranafest wants to take it to the next level of “greening” a festival. We are on a mission to give back the green to the industry that created us. Give back the green to the ones who support us in all we do. What better way to put devotion in motion than to give the green to organizations that will continue the work beyond our weekend of devotion, practicing seva 24/7. Giving back to those in need, offering the skills & tools necessary to raise our collective vibration. You know…that blissed out feeling we get from sharing in community, singing, dancing, soaking and laughing! We all feel it in a weekend of absolute divine play at a festival. Our intention at Pranafest is to activate and heal the life-force – the Prana – that pulses through each of us, our relations and the earth. That we may live to our fullest potential in our bodies, minds, hearts, local and global communities. We practice to nourish spirit, we gather to nourish tribe, we give back because we honor the path that lead us to success. We hope to influence the change from an outdated business model of “all for profit” to an industry standard of investing in our tribe, our future our fellow humans. That is the best seva we can imagine…giving from the heart…to the heart. Give Back Yoga community members: save $30 on Pranafest tickets with promo code SEVA. Yogi Tunes is sending out a call to the yoga community to join our mission of bringing yoga to the underserved, by doing what they do best. Sharing music. Now, yogis and music lovers can sign up for the Give Back Yoga Foundation’s monthly newsletter through the Yogi Tunes site and receive a free music download as a thank-you for joining the mission. We’re grateful for this opportunity to reach many new friends with our message of yoga service, healing and grassroots social change – and we hope you’ll be one of them! Visit Yogi Tunes to sign up for our newsletters and get a free album download. 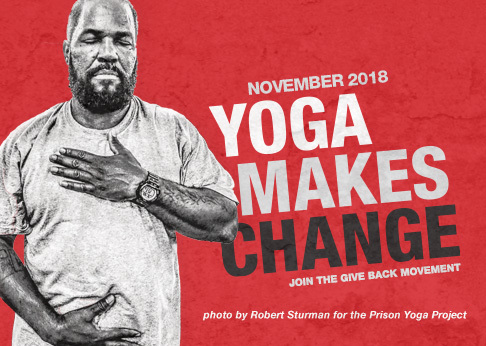 Yogi Tunes is also re-igniting their “Music With a Cause” program to help Give Back Yoga share the transformative practice of yoga with those in prison. To join Yogi Tunes in giving men and women behind bars a chance to build a better life, check out Anahata Yoga Dub by Desert Dwellers, an album of heart-warming grooves and spacious ambient tracks that’s a perfect accompaniment for your own practice. Just enter giveback at checkout to save 10% on the album and donate 50% of the proceeds towards our work of bringing free Prison Yoga Project books with incarcerated men and women. Shop now and put a free practice guide in the hands of a prisoner. “For us, music is a gift meant to be given. A soundtrack of the soul that flows as freely as a river, winding through our hearts and blessing our lives at every turn. As artists we learn to receive this gift by listening deeply to what is within us and what is all around us – the current of life in it’s infinite wisdom and grace. Each of us here at YogiTunes has experienced the deeply healing powers of music, given to us as freely as taking a deep inhale. So it’s with joy in our hearts that we find ways to be of service to others in offering the gift back, just like the exhale. Free music, for a cause: share this offer with your friends via email and social media to help us bring yoga to those in need of healing. Yoga mats matter. In your practice. To a teacher who wants to offer yoga to underserved communities. To a veteran re-entering civilian life. To someone battling an eating disorder. Have you been waiting for the right time to upgrade your yoga mat? The time is here: through June 30th, when you purchase a Sequence STILLMOTION Yoga Mat, a matching mat will be donated to Give Back Yoga to help a certified teacher bring yoga to populations in need. Why are we so excited about this campaign? For starters, it will help us to meet a growing demand for supply grants to help teachers “jumpstart” new classes for underserved members of their communities. Learn more about our grant recipients. We’re also thrilled to be able to offer top-quality mats for therapeutic applications. Because STILLMOTION mats are engineered to support proper alignment in active poses and comfort in restorative poses, they are an excellent resource for students who are just discovering yoga as a tool to support recovery from trauma. Will you help us to spread the word about this offer, and put mats in the hands of as many teachers as possible? To support this campaign, simply visit the Buy a Yoga Mat, Give a Yoga Mat landing page and order a mat during the month of June. We’ll work with Sequence to do the rest! Help us to give the gift of yoga: buy a mat, give a mat. Give Back Yoga Foundation is honored to be a seva partner of Bhakti Fest 2014, with a portion of all proceeds from this year’s three Bhakti Fest events supportingd our work of bringing yoga to underserved populations like veterans, those struggling with food and body image issues, prisoners and at-risk youth. Because we know that organizing a major yoga and music festival – let alone three !- can be an all-consuming task, we asked Bhakti Fest’s organizers to tell us why the festival is committed to sharing its time and resources. To honor our community’s support of yoga service, Bhakti Fest is generously offering Give Back Yoga community members $50 off three-day festival passes for any of their three sister events. The next event is coming up soon: Bhakti Fest Midwest, a heart-opening solstice celebration of yoga and music hosted in Madison, WI on June 20-22. We hope you’ll join us to chant along with award-winning kirtan artist Krishna Das, practice with world-renowned yoga teachers like Saul David Raye, and dance, sing, camp and play with fellow yogis and yoginis! Enter code GBY14 at checkout to save $50 off three-day festival passes. Are you a veteran? Bhakti Fest shares our commitment to making yoga freely accessible to those who have served our country. Vets and active duty service members can get free admission to any Bhakti Fest event by visiting the festival website, printing out a free ticket, and showing proof of military ID at the gate. Looking forward to seeing you there!